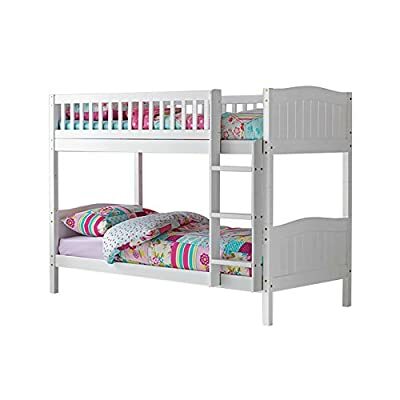 The Rosa bunk is the newest addition to our Bunk Bed Range and is a solid wood frame available in white or pine, the curved headboard and foot board design add a smooth finish to the bunk which is supported by a solid frame, along with a fixed slatted base and can split into two single beds if required. 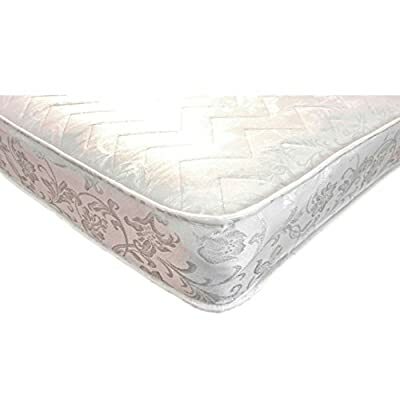 The ladder is adjustable to either the left or right side of the frame to suit your requirements, the dimensions for the bunk are H148cm x W98cm x L198cm approximately and the under bed clearance is 20cm..Mattress Specifications: Depth 18.5 cm / Luxury Feel Damask Micro Quilted Cover / 13.5 gauge open coil spring system.PLEASE NOTE: To ensure your new furniture is suitable for your home, please remember to measure your available space before ordering. We will only ship to the address on your Amazon account. Also please note that we 'ship fast' so please expect to receive your delivery within 2 to 5 working days. We will only deliver to the front door of the building as our couriers are not insured to carry goods in or upstairs. Please ensure that you message us with a valid telephone number when ordering so we can contact you if there are any issues. You can keep track of your order by checking the tracking details supplied under your purchase history. 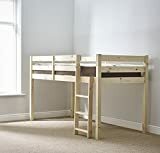 If you have any queries relating to this then please message us and we will be happy to help.